Lenovo’s CES chest of goodies has been opened at CES and among them is an updated Thinkpad Carbon X1 with Haswell, new high res screen and other upgrades. The new Thinkpad Carbon X1 comes with the same size 14 inch screen but now the display is now available with a higher WQHD resolution of 2560×1440 in addition to the original 1600×900 screen at 300 nits brightness with an option for a 10-point multi-touch touchscreen. Lenovo also includes its ColorBurst Display for a “superior viewing experience”. CPU options now include Intel’s latest Haswell chips up to Core i7 as well as vPro, a fingerprint reader and TPM for security and manageability and you can opt for Intel HD 4400 or 5000 graphics options for a bit of gaming. RAM maxes out at 8GB while storage goes up to a 512GB SSD. The keyboard is backlit and features adaptive keyboard technology which presents relevant controls when needed for different tasks. Port connectivity includes 2x USB 3.0 ports combo headphone jack, stereo speakers, full size HDMI port and miniDisplay port, HD webcam, support for Lenovo’s OneLink docking connector and Ethernet via a supplied cable. Bluetooth 4.0, Wi-Fi 802.11ac, NFC and optional 4G are also available. Lenovo also has some other extras in the form of Voice control provided by Nuance’s Dragon 1.5 and gesture control to view photos and presentations. 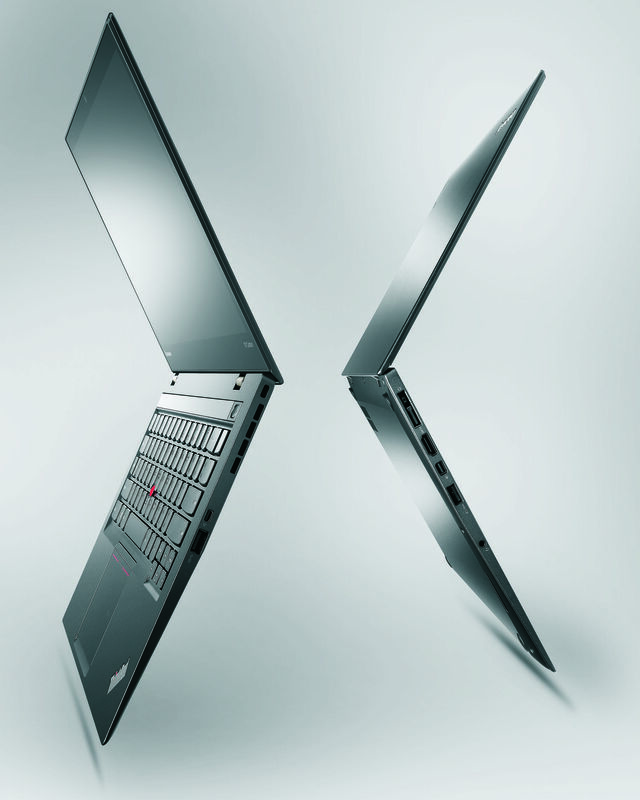 The X1 is still thin and light, weighing in at less than 2.9 pounds and 17.7mm thin and has its signature carbon fiber resistant design with a 13% thinner fan. Battery life is quoted at 9 hours and its dimensions start at 331 x 226.5 x 17.7m for the non-touch version. The Thinkpad Carbon X1 certainly packs a lot into its slim and light frame and looks like a significant update to the original. Shipping is expected to start this month starting at $1299.